13 February 2015 – The United Nations World Health Organization (WHO) announced today that it will huddle with medical teams from outside the Ebola-affected countries next week in Geneva to see how they can help in the last phases of the fight to bring the number of cases down to zero. Earlier, Miss Clark met with a number community groups in Conakry, Guinea, where she stressed the vital importance of community advocacy in stopping the outbreak. Her mission will conclude with a visit to Sierra Leone early next week. 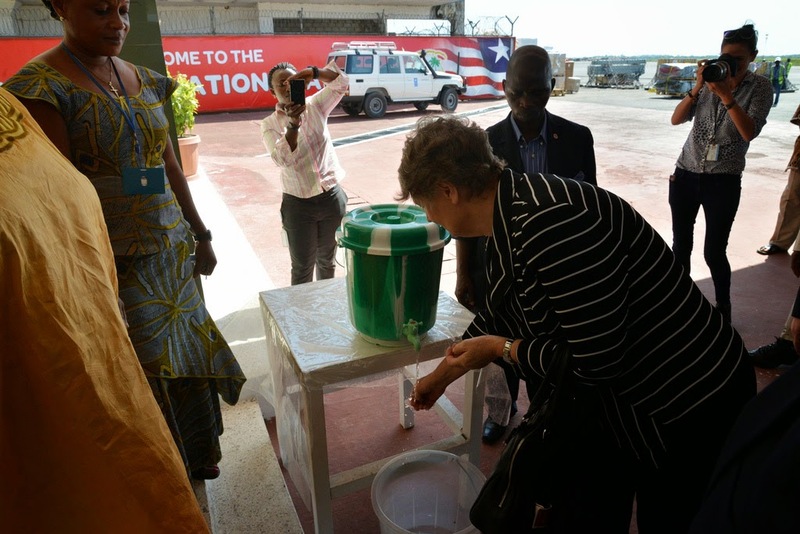 UNDP is working with the national authorities and local, regional and international partners, including the African Development Bank, the European Union and the World Bank, on an Ebola Recovery Assessment, and in support of national strategies, as part of its mandate to the lead the UN system in the Ebola-related recovery efforts. The World Food Programme (WFP), meanwhile, stressed the need to support communities once they are Ebola free. WFP is providing these communities with three months of food assistance so they can restart their livelihoods, and it is also supporting local markets and economies by purchasing local products. WFP has forged a new partnership with WHO to support health workers in getting to zero cases by providing operational support to 63 field surveillance sites, some deep in the jungle. In Geneva, Dr. Ian Norton, who heads WHO’s medical team in West Africa tackling Ebola, told reporters that during the technical meeting from 17 to 19 February, options would be discussed on how foreign medical teams could get involved with other pillars of Ebola-response, including surveillance and social mobilization. He described foreign medical teams as clinical providers – doctors and nurses – coming from outside of their countries of origin into a country with a health emergency. There were currently 58 such medical teams working at 66 Ebola treatment centres in the infected areas in West Africa. They were provided by some 40 different organizations dealing with the Ebola response, according to WHO. Dr. Norton said the foreign medical teams had been part of a “fire-fighting stage of the response” when the lack of clinical capacity was hampering the rest of the response. He noted that the focus now was on the public health stage, with a view to bringing the number of cases down to zero. The latest WHO statistics show that nearly 23,000 people have been affected by Ebola with more than 9,200 deaths. WHO also reported that despite improvements in case finding and management, burial practices, and community engagement, the decline in case incidence has stalled. In other news the UN Population Fund (UNFPA) said that more than $56 million is urgently needed to provide vital reproductive, maternal and newborn health services in Guinea, Liberia and Sierra Leone. This amount, according to the agency, will cover the initial six months of the UNFPA-led Mano River Midwifery initiative – a new Ebola-response effort that would increase the number of health workers to ensure that women and girls of childbearing age stay healthy and safe despite the crisis. The funds will also cover the cost of contact-tracing to identify all potential contacts of Ebola cases and help prevent infections.